GREAT DANES ARE LIKE POTATO CHIPS… YOU CAN’T HAVE JUST ONE! Great Danes are the most loyal loving pets. Being in the middle of North Carolina we have found people will travel to find their perfect new family member. We want meeting your new baby and learning all there is to learn about Great Danes to be a happy and fun time. The Garner family is here to help. The moment the babies are born until they are well into their golden years we like to stay in contact with families by sharing pics and updates. We know how exciting it is to get a new puppy therefore we do everything we can to keep in contact and share their growth from day one. 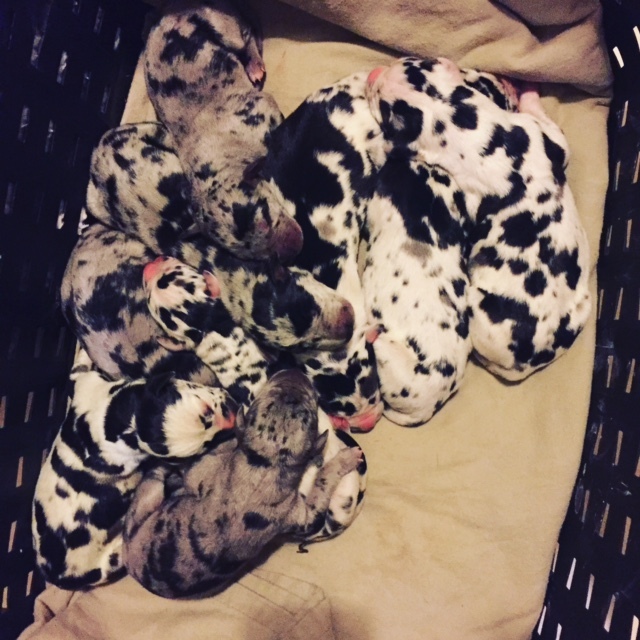 We welcome visitors to come and meet our Great Dane parents and puppies after 1 week old. If you’d just like to come see and meet our Great Danes before getting on a waiting list please contact us, we are happy to schedule a time for you to come out and meet everyone. We take pride in our awesome Danes. We strive to maintain sweet, gentle temperaments, beautiful faces/heads, and a healthy family of Great Danes. Our Great Danes are health tested annually by our personal vets office as well as have been through thorough breed specific screenings to ensure they are top quality for breeding. 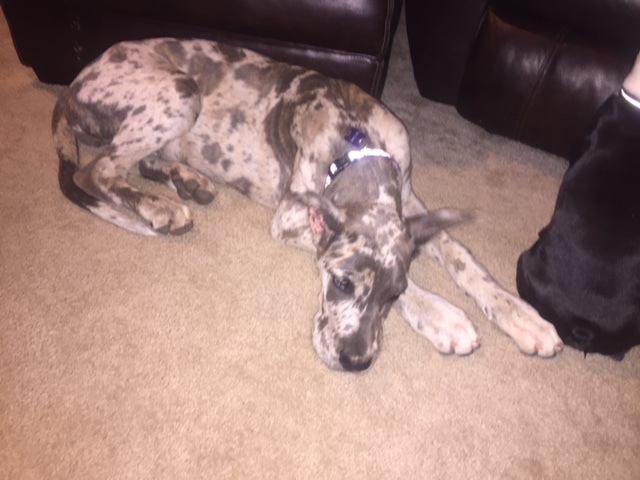 Since we have had the same male line for the last 18 years and we purchase our females from excellent breeders that we consider close friends we are confident each puppy is genetically healthy that comes from Garners Great Danes. All of our Great Dane puppies are welcome home at any point in their lifetime for whatever reason. 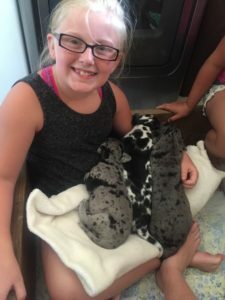 We try to screen each family as well as we can to ensure our Great Dane puppies live happy long lives in excellent loving homes. However we do understand that lives can change which is why we insist that they come back to our home at any time in their lives if they need to be rehomed. It keeps them safe. More details are on puppy page. Each Great Dane puppy purchased is health tested by our veterinarian and dewormed with Panacur (prescription wormer) before leaving our care. Each Great Dane puppy receives their first vaccine from our veterinarian before leaving our care as well. All puppies will need consecutive vaccines from a veterinarian to keep them safe from diseases which we will go over and stress to you many times. We will go over all details that will be included in your puppy pack before you take your new baby home. Please contact us if you know of a Great Dane that is in need of a home specifically here in North Carolina (we are not afraid to travel when needed). We are always in contact with people looking for an adult Great Dane to bring into their family. Since they came from another breeder we would just need to confirm there isn’t a contract that says they must be returned to said breeder. We take our love for Great Danes and try to care for all that need our help. Our new Facebook page is public! Please check it out – GARNER’S GREAT DANES OF THE CAROLINAS page. You can see our daily adventures and life with our Great Danes on a daily basis. We love sharing our family pics! It will show you how much we love and care for each of our gentle giants. If you haven’t had the joy of sharing your life with one, you will soon want to. 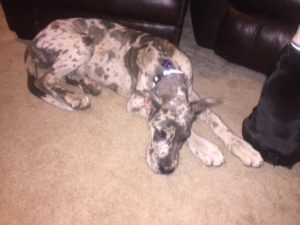 Once you are a Garner Dane owner we have a private Facebook group for our puppy owners to share updates, stories, and pics. You will send a request to join once you have committed to a Garner Dane, at that time we will approve you. Don’t forget our motto – GREAT DANES ARE LIKE POTATO CHIPS… YOU CAN’T HAVE JUST ONE!